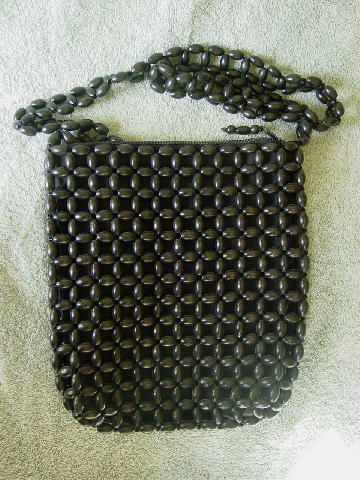 This vintage purse has an exterior of oval black wooden beads with an interior synthetic somewhat see-through fabric lining with an interior open pocket. There is a top side to side zipper closure with 3 beads attached to the metal pull. It has a 40" long by 1" wide shoulder strap. It's from a former San Francisco model, who also owned the smaller black rounded beaded purse.